Brits love their tea and consume around 165 million cups every day. Assuming it takes up to three minutes to boil a kettle, that’s nearly 8,250,000 hours wasted waiting for a brew! Enter boiling water taps: they’re a quicker and more efficient way to get a caffeine fix, but many homeowners don’t fully understand them. Matthew Hicks, Head Of Product at Bristan, discusses the common misconceptions around boiling water taps and how installers can put customers’ minds at ease. Convenience is what makes boiling water taps so appealing, although the thought of having extremely hot water available on demand is also a concern to some homeowners, especially with young children around. The truth is, a boiling water tap is generally safer than a standard electric kettle, for many reasons. Firstly, boiling water taps stay in a fixed location, unlike kettles which can easily be knocked or dropped when pouring. What’s more, a trailing kettle cable could easily be pulled by a small child, with potentially disastrous consequences. Kettles also often get very hot on the outside, whereas with a cleverly-designed boiling water tap the hot water is stored in the tank out of reach below the sink, meaning the spout remains cool to touch. Additionally, certain boiling taps include extra safeguards such as safety release buttons so that hot water can neither be distributed nor left running by accident. For example, Bristan’s Rapid 3-in-1 offers several robust safety features – including a cool touch spout and safety button – to ensure peace of mind for both the installer and the homeowner. Another falsehood that homeowners believe is that switching to a boiling water tap will drive up their utility bills. But compared to a standard kettle, boiling water taps win on the energy-efficiency front too. One of the biggest issues with kettles is overboiling. Many people will completely fill the kettle just to make one hot drink, consequently wasting energy to boil water which is not ultimately used. This is without even broaching the heat loss which results from often ineffective kettle body insulation. The technology of a boiling water tap means that only minimal energy is consumed to maintain the water at a specific temperature. Heating the water from cold takes just 10-12 minutes, depending upon inlet temperature, but once this heating process is complete, it will stay at this temperature, and will be kept constantly full through displacement. This consistent temperature means that, unlike a kettle, which has to heat the water from cold, there is no energy spike to bring the water to boiling each time hot water is required. 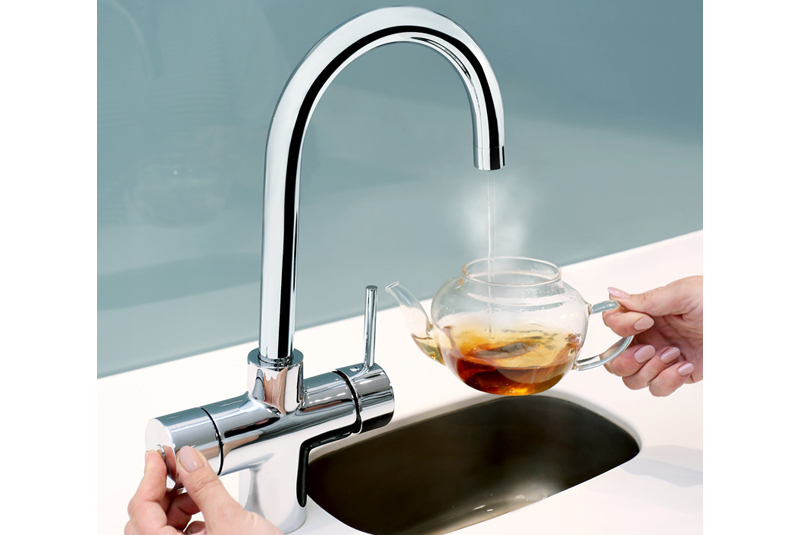 Boiling water taps are more water efficient too, as the user only ever dispenses the exact amount they need. Given that the cost to run is minimal, we would always recommend leaving a boiling water tank switched on, unless the occupier is going to leave the property for a month or more. Finally, many people discount boiling water taps because they think the tap won’t fit their existing hole, their kitchens are too small to accommodate a water tank, or they will need to add ventilation to their cabinets. The Rapid 3-in-1 tank is stored under the sink for easy access for adjusting the temperature or changing the filter, and no ventilation is required for this. It’s also very compact, measuring 31.5 by 22.5 by 20cm, so it can easily fit under most sinks. The tap simply fits the existing tap hole, so there’s no need to make any special amendments. To make life even easier, every component required to install the Rapid 3-in-1 comes packaged together in the box, including tap, tails, tank, pressure reducing valve and filter – meaning no ‘oops’ moments when you arrive on site and realise that you’re missing a part. As boiling water taps continue to grow in popularity, installers who are already clued up on how they work will be best placed to reap the rewards.